BWM Canada broke ground Tuesday on a new distribution centre in Mississauga, Ont., that will cut delivery times of original-equipment service parts as well as accessories to dealerships across Canada. 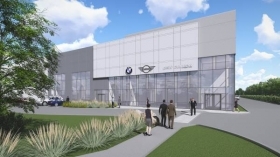 The new 280,000-square-foot (26,000-square-metre) facility will be 50-per-cent larger than BMW’s current facility in nearby Whitby and can be expanded. The Whitby location will be phased out and the new centre is scheduled to open in 2018. Based in Richmond Hill, Ont., BMW Canada has 48 retailers, 30 Mini dealers and 20 Motorrad motorbike locations. The Mississauga distribution centre is strategically positioned near Pearson International Airport, rail yards and major highways so it can expedite inbound and outbound shipments. It also allows BMW staff to take advantage of Metrolinx public transit. Hans Blesse, company president and CEO, said in a statement that faster delivery of parts will lead to BMW owners spending less time away from their cars and will improve customer satisfaction. “All top priorities for us,” he said. “After a remarkable 25 consecutive years of growth in Canada, it is the right time to expand and invest in our customers and our future,” Blesse said.